Three personalised embroidered ladies cotton handkerchiefs set. Three personalised embroidered ladies cotton handkerchiefs set. 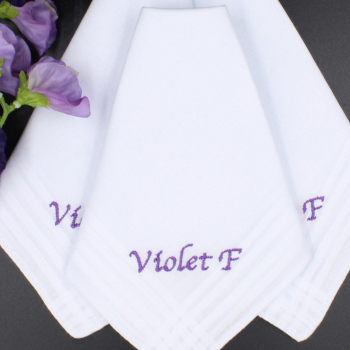 You get 3 standard white cotton ladies handkerchiefs with a plain hem - you can choose to have them personalised with initials or a name. Just fill in the option box and choose what colour embroidery thread you would like us to use. Make someone very happy with a unique gift dedicated to them. Please allow at least 1-2 days for personalised orders to be dispatched as they are customised to order by Amys Gifts.